Aberration [ aberration of (star)light, astronomical aberration, stellar aberration ]: An astronomical phenomenon different from the phenomenon of parallax whereby small apparent motion displacements of all fixed stars on the celestial sphere due to Earth's orbital velocity mandates that terrestrial telescopes must also be adjusted to slightly different directions as the Earth yearly transits the Sun. Stellar aberration is totally independent of a star's distance from Earth but rather depends upon the transverse velocity of an observer on Earth, all of which is unlike the phenomenon of parallax. For example, vertically falling rain upon your umbrella will appear to come from in front of you the faster you walk and hence the more you will adjust the position of the umbrella to deflect the rain. Finally, the fact that Earth does not drag with itself in its immediate vicinity any amount of aether helps dissuade the concept that indeed the aether exists. Star Aberration produces visual distortions of the spatial external ( spacetime ) world, a sort of faux spacetime curvature geometry. See: Celestial Sphere; also Parallax which is a totally different phenomenon. § Absolute motion is the translation of a body from one absolute place into another, and relative motion the translation from one relative place into another. note: The relativity principle denies any sort of absolute motion, time or space. See: Galilean Relativity; Relativity Principle. "Action at a Distance": According to Newton's definitions of absolute motion, time and space as well as his well-known axiom of motion, , bodies effect each other's motions by the forces applied to those masses and hence causing their accelerations against a background of absolute immutable space and within a period of absolute time. Now as forces are applied across empty and absolute space, even at great distances, there will be an instantaneous ( re - )action at a distance without any known intermediary element of nature such the aether to facilitate such ( re )action. Hence because of Newton's concepts of absolute motion, time, and space, all such forces acting at a distance, and regardless of the distance involved, will do so instantaneously, unlike Maxwell's mediating electromagnetic fields propagating at finite , the speed of light, by which bodies exert forces on each other at great distances, if at all. See: Aether; Maxwell's Theory of the Electromagnetic Field. Addition of Velocities: See: Velocity. Aether [ Luminiferous Aether ]: The ( Luminiferous ) Aether was imagined by physicists since Isaac Newton as the invisible "vapor" or "gas aether" filling the universe and hence as the carrier of heat and light to our eyes, although we now understand by Maxwell's Equations that these are both a unified electromagnetic phenomena. See: Corpuscular Theory of Light; Dark Energy. Anisotropy: Anisotropy refers to particular regions of cosmic spacetime exhibiting different temperature values for the cosmic microwave background ( CMB ) along different measured axes of direction which indicate how tiny perturbations in the primordial distribution of background energies from the earliest times after the Big Bang caused galaxies and other large - scale structures to form ( primordial nucleosynthesis ) from the initial cosmic blast debris. Our cosmic universe on a large scale is approximately isotropic and homogenous ( The Cosmological Principle ), but not precisely so, owing to these tiny anisotropies just described. See: Big Bang; Cosmic Microwave Background; Isotropy. Anthropic Principle: From the Greek word for human being ( ἄνθρωπος - ánthrōpos ), the Anthropic Principle has come to mean that there exists in the universe finely tuned constants and forces such as spacetime curvature, , the fine - structure constant∗ or the Summerfeld fine - structure constant, which may or may not actually be constant, introduced into physics in 1916 by German theoretical physicist Arnold Summerfeld ( 1868 - 1951 ), consisting of the speed of light, Planck's Constant, elementary charge, and the permittivity of free space or space's ability as an intermediary to transmit forces, and the Four Fundamental Forces of Nature ( strong nuclear force, weak nuclear force, electromagnetism, and gravity force ) together with dark energy, all of which conspire to produce the configuration of the present universe and thence the carbon necessary for intelligent human life on Planet Earth to have successfully evolved. Change one constant or one force, and intelligent human life on Planet Earth ceases to exist. [ note: whether intelligent human life continues successfully on Planet Earth is definitely up for debate ] This latter is also sometimes referred to as "carbon chauvinism" as there may actually be alternative bio - chemistries in the universe as the basis for the development and evolution of intelligent life forms different from our own. Nevertheless we are what we are in this carbon - based world of ours, and the Anthropic Principle still stands as a unifying philosophical statement as to why everything exists as it does. AU [ astronomical unit ]: Earth - Sun distance; modern accepted distance is 150,000 km ( 93 million miles ); hence, 1 AU = Earth - Sun distance or approximately 150,000 km. Big Bang: The cosmological model of an explosive event arising out of an intensely dense and hot plasma state that began the origin of our present universe, estimated to be approximately 13.73 billion years old, at time , further suggesting that the fabric of spacetime itself is expanding outwards towards Elsewhere. The Big Bang model is deemed entirely consistent with both general relativity and the Cosmological Principle. Monsignor Georges Lemaître ( 1894 - 1966, Belgian Roman Catholic prelate, astronomer and relativity cosmologist ), played a pioneering role in first proposing the theory of the Big Bang in his original 1927 paper, one of the direct consequences of Einstein's General Relativity Theory. See: Elsewhere; Cosmological Principle; General Relativity. Black Hole: Black holes are massively dense regions of space described by Einstein's Theory of General Relativity whose gravitational fields are so energetically powerful that no other object or electromagnetic field within the event horizon of the black hole possesses an escape speed exceeding the speed of light, ; hence, nothing which has fallen within the event horizon of a black hole will ever escape. Prof. Stephen Hawking together with Israeli physicist Jacob Bekenstein of the Hebrew University of Jerusalem, Israel, have, however, produced mathematics ( 1972 - 1974 ) proving that a certain amount of captured matter will escape the grasp of a black hole in the form of thermal energy, called "Hawking Radiation", which has yet to be empirically observed. 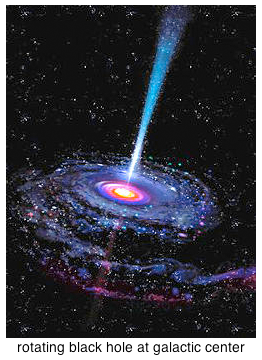 Also recent astronomical research is showing that each and every galaxy, including Earth's Milky Way, has at its very core a black hole suggesting that early galaxy formations and black holes are intricately associated. Upon the gravitational collapse of any star exceeding 5 solar masses, this cosmic condition will inevitably produce a black hole. 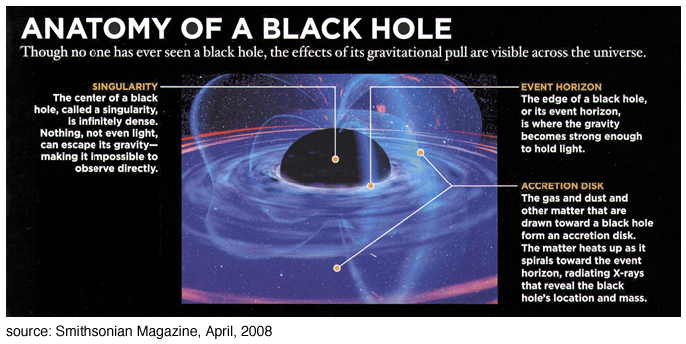 See: Event Horizon; General Relativity. Brane Cosmology: See: String Theory. Centrifugal Acceleration: The equal but opposite acceleration force to centripetal acceleration force according to Newton's 3rd Law of Motion. The Clocks Paradox: See: The Twins Paradox. Compton Effect: The Compton Effect is whenever an incoming - photon ( monochromatic beam of - rays or gamma rays ) hits a stationary electron, part of the photon's energy is transferred to the released electron with the consequent result of the scattered - photon having a lower energy level as well as concomitant lower frequency and longer ( increased ) wavelength. The collision will have enough energy to make a new wave - particle of the same type, in this case another electron. See: Inverse Compton Effect. Conservation Laws: The laws of nature according to which some aspects of nature such as energy and matter are neither created nor destroyed within the boundaries of a given system of forces and masses and not interfered with by elements or quantities outside the boundary of the given system. Conservation of Energy: Total energy is neither created nor destroyed only re - distributed within a given domain of spacetime. Conservation of Mass: The total amount of mass contained in any aggregate of object bodies [ or mass - particles ] before any change(s) in motion will be equal to the total amount of aggregate mass after any change(s) in motion of this aggregation of object bodies [ or mass - particles ]. Conservation of Momentum: For any closed system, the total amount of momentum, defined as the aggregate product of masses times their respective velocities, is neither created nor destroyed and hence is constant and thereby conserved. Continuum: For any region of spacetime there are event - points surrounded by a neighborhood of other event - points sharing common properties of condition or quality and whose differences, if any, demonstrate a gradual transition from one condition or quality to another, without any discontinuity or abrupt change. The parallel ( gyroscopic ) transported affine connector for smoothly conjoining invariant Spacetime Intervals, is the general relativity mathematical object for gravity field continuum. See: Law of Continuity. Copenhagen Interpretation of Quantum Physics: A probabilistic wave function interpretation of sub - atomic particles formulated by Niels Bohr and Werner Heisenberg while collaborating in Copenhagen, Denmark around 1927, which states that in principle it is no longer possible to simultaneously discover the precise velocity of a particle associated with its position and vice versa. See: Heisenberg Uncertainty Principle; and "Multiple Universes", Scientific American, Dec. 2007. Corpuscular Theory of Light: Promulgated by Isaac Newton, this theory sets forth the idea that light is composed of small discreet particles or corpuscles. In this sense, the corpuscular theory of light resembles the modern photon quanta, but the theory failed under conditions of "light interference" and "diffraction", the bending of light. Cosmic Microwave Background [ relic radiation; abbreviated CMB, CMR, CBR, MBR or even relic radiation ]: The relic electromagnetic photon radiation was caused by the Big Bang 13.73 billion Earth - years ago when after about 380,000 years old, photons stopped interacting with the intensely hot plasma of electrons and protons, themselves forming hydrogen atoms as evident by the decoupling photon electromagnetic radiation from matter. Photons thereafter began their long wandering cosmic journey, creating the surface of last scattering which is only just now reaching observers here on Earth. Presently the photon electromagnetic radiation reaching Earth has cooled to about 2.725 kelvin black body temperature and will continue to cool as the universe continues its inexorable expansion towards Elsewhere. The persons responsible for predicting the cosmic relic radiation and writing the mathematics of it are naturalized American ( born Ukrainian, escaped Stalin's Soviet oppression and anti - semitism in 1933 - 1934 ) George Gamow and Jewish - American Ralph Asher ( Ascher ) Alpher ( together in 1948 ); Alpher and Bronx, New York City, Robert Herman ( together in 1948 -1950 ); American Robert Dicke and Russian physicist Yakov Zel'dovich ( together in early 1960s ) -- all brilliant and genius cosmologists and physicists beyond compare, any single one of them! Naturalized German - Jewish - American Hans Bethe ( Sraßburg, Alsace - Lorraine, 1906 - Ithaca, New York, 2005 ) co - authored the 1948 paper with Gamow and Alpher but did not contribute any of his mathematics to the thesis. In 1964 radio astronomers Naturalized German - Jewish - American Arno Penzias ( 1933 - ) and American Robert Woodrow Wilson ( Texas, 1936 - ), both at Bell Telephone Laboratory, first confirmed the cosmic microwave background for which they jointly received the 1978 Nobel Prize in Physics. See: Big Bang; Elsewhere. Cosmological Constant: The observation in the 1990s that the known universe is presently expanding at an ever accelerating rate is being ascribed to dark energy where one of the mathematical concepts at this time to describe the effects of this dark energy is being given by , a static scalar field for a fixed energy density in the universe first proposed and then later abandoned by Einstein. See: Dark Energy; Quintessence. Cosmological Principle: The Cosmological Principle as derived from the Copernican Principle is the philosophical proposition that because the Earth is not the center of the universe and that the universe itself has no inherent unique center, then therefore the universe itself is both homogeneous and isotropic as seen over large scale observations of space. This means that over truly large scales of space that the universe is the same from point to point - i.e., the universe appears the same along all lines of sight for any observer situated at any place in the vast expanse of the universe. So, whereas observable space is known to be homogeneous and isotropic over large scales of space, nevertheless it has come to be observed for reasons still unknown that the universe is non - homogenous and non - isotropic over large scales of time. What this means is that since about half the time of the Big Bang's onset, gravity's effect upon all matter has declined to where not only is the universe expanding but it is expanding at an ever accelerating rate! This further means that time's arrow or march is perhaps different or distorted from whence it originated some 14 billion years ago. We now know that during the first half of the universe's existence that gravity was the predominate force in the universe in gathering in atoms of primordial dust and then into larger clusters of atoms of matter to form galaxies and superclusters of galaxies. But since that earlier time dark energy is perhaps now the dominate force in nature's expanding universe, whose expansion is occurring at ever accelerating rates and making the universe both non - homogenous and non - isotropic over large scales of time and heading towards The Big Freeze or Big Rip! This later condition is also known as the Heat Death of the Universe where spacetime has reached maximum entropy which derives from the 2nd Law of Thermodynamics. Nevertheless over non - cosmological scales of space and time, astrophysicists and cosmologists still adhere to the concept of the universe being homogeneous and isotropic and this is the present position that this glossary will take for purposes of simplicity and actual epistemological unknowing. See: Homogeneous and Isotropic; Big Bang. Covariant [ General Covariance ]: Component sets of coordinates for quantities in one coordinate system will transform invariantly into equivalent coordinates in another ( arbitrary ) coordinate system by use of their respective transformation law employing the mechanics of tensor mathematics. Covariant basis vectors are utilized in both special and general relativity mathematics: Lorentz covariance for special relativity and general covariance for general relativity. Invariant quantities whose values are the same under all transformations are called scalar such as the speed of light, . See: Tensors. hyperbolic space ( or spacetime ) is one in which the universe possesses a negative curvature of space and is normally associated with an unbounded and infinitely expanding universe heading towards a Big Freeze or Heat Death. Intimately related to the type of curvature of space the universe possesses is the density parameter omega, , of the "Friedman Universe" for mass - energy distribution which is the ratio of the average density of mass - energy of the universe to a critical density defined for the universe to be flat ( zero curvature ). It was Russian cosmologist and mathematician Alexander Friedmann ( Friedman or Fridman, ancestorially Jewish, born 1888, St. Petersburg, Imperial Russia - died 1925, Leningrad, Soviet Communist Russia ) who in 1922 derived the first set of cosmology equations for the expansion of homogeneous and isotropic space in terms of general relativity using omega, , in his equations. Nevertheless, using supernova events over great distances into the observable universe for discerning spacetime intervals as well as astronomical measurements of mass and energy densities, it still seems that the observable universe possesses curvature at or close to zero and is therefore homogeneous and isotropic over large scales of space where Euclid's geometry is still a good approximation. On the other hand, whereas observable space is known to be homogeneous and isotropic over large scales of space, nevertheless it has come to be observed for reasons still unknown that the universe is non - homogenous and non - isotropic over large scales of time. What this means is that since about half the time of the Big Bang's onset, gravity's effect upon all matter has declined to where not only is the universe expanding but it is expanding at an ever accelerating rate! This further means that time's arrow or march is perhaps different or distorted from whence it originated some 14 billion years ago. We now know that during the first half of the universe's existence that gravity was the predominate force in the universe in gathering in the atoms of small dust particles and then later into the larger clusters of atoms of matter possessing mass to form galaxies and superclusters of galaxies. But since that earlier bygone time, dark energy is perhaps now the dominate force in nature's expanding universe, whose expansion is occurring at ever accelerating rates and making the universe both non - homogenous and non - isotropic over large scales of time and heading towards The Big Freeze or Big Rip! This latter condition is also known as the Heat Death of the Universe where spacetime has reached maximum entropy which derives from the 2nd Law of Thermodynamics. However over non - cosmological scales of space and time, astrophysicists and cosmologists still adhere to the concept of the universe being homogeneous and isotropic and this is the present position that this essay will take for purposes of simplicity and actual unknowing. See: Big Bang; Dark Energy; Special Theory of Relativity; General Theory of Relativity. Dark Energy [ Quintessence ]: See: Aether. an - ray image of hot gas lying within the cluster. Electromagnetic Wave: See: Maxwell's Theory of the Electromagnetic Field. Electroweak Force: The unification of electromagnetism and the weak nuclear force at energies above 102 GeV ( giga electron volts ) or 1015 K ( kelvin temperature ) extant in the early moments of the Big Bang. American physicist Steven Weinberg∗ together with colleagues Abdus Salam and Sheldon Glashow won the 1979 Nobel Prize in Physics for their mathematics establishing the electroweak force. See: Big Bang; Four Fundamental Forces of Nature. note: Prof. Weinberg is a strong outspoken supporter of Israel who's cancelled lecturing trips to the United Kingdom because of the recent UK Teachers Union boycott of Israel's world - class universities ( viz., Hebrew University of Jerusalem, Weitzman Institute of Science, Technion [ aka Israel's Institute of Technology ], Bar - Ilan University, Tel Aviv University, University of Haifa, Ben Gurion University of the Negev ) where politics should never enter into the classrooms of physics and mathematics. is integral to the ( Summerfeld ) fine - structure constant. It is considered indivisible and hence one of nature's fundamental constants. It was first measured by Americans Robert Millikan and Harvey Fletcher, both experimental physicists, in their famous oil - drop experiment in 1909, where subsequent sundry experiments have brought us its modern value. Although both Americans jointly collaborated in the 1909 oil - drop experiment, by secret agreement only Millikan took responsibility for the experiment and for which he alone solely won the 1923 Nobel Prize for Physics. The terminal velocity was measured by eye and hand notes through a microscope inserted into the chamber. See: Anthropic Principle; ( Summerfeld ) Fine - Structure Constant. Newton's theory of planetary motion states that a smaller planet's mass moving under the gravitational influence of a greater planet's mass will be one of the conic sections. In fact, only the total energy available for any given planetary orbit will determine the type of planetary conic section being formed and, indeed, all the planetary orbits are ellipses with the Sun at one of the foci. Also, but just theoretically, if a planetary body had just enough energy to escape its bonds to infinity but without enough energy to maintain a finite constant outward velocity, the trajectory at infinity would be parabolic; if, however, there were enough kinetic energy beyond its initial escape for an indefinite amount of constant velocity, the trajectory path would be hyperbolic. See: Law of Newton's Universal Gravitation; Light Cone; Trajectory. Elsewhere: In special relativity a region of spacetime that is outside the light cone of a given event and hence a region that is neither past nor future. Namely, this is a region of spacetime far beyond in the cosmos where light traveling between any two given events can never be detected by any Earth observation. See: Light Cone. Energy: The concept of energy is usually given as tautology something like "energy is the ability of a body to perform work", yet how is "work" defined? Work is normally defined as a change in energy from one time period to another which equivalently results in a translating force moving a body along a distance during this same duration of time. Hence, this all is circular reasoning and therefore becomes a tautology. It is best therefore to say that energy is the capacity of a system to invoke force in the motion of bodies or particles where force is a modifying action made upon a body or particle. See: Force. 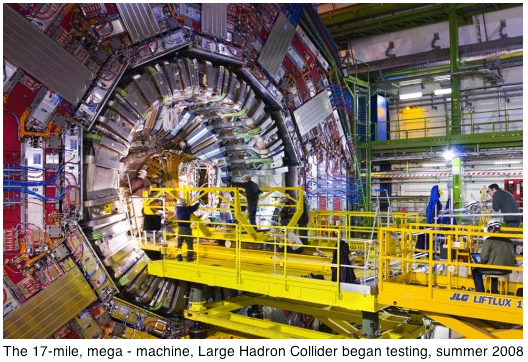 where both mass, , and speed of light, , have common sense identities, although the true origin of mass, , will not be understood until finally the Higgs boson particle is discovered ( now discovered 2011 - 2013 ) and fully comprehended as to how it assigns "mass" to a body of matter. See: Higgs Boson; Special Theory of Relativity. for inertial mass. See: Inertial Mass. Entropy: The condition best described by the 2nd Law of Thermodynamics by which an isolated system over time will dissipate any differences in temperature, pressure, and density and hence all its potential energies will uniformly even out to the lowest common denominator condition of energy distribution. Ether [ luminiferous aether, luminiferous aether wind ]: See: Aether. Equation of State: Thermodynamic equation providing the mathematical relations of matter involving temperature, pressure, volume and/or internal kinetic energies. Equivalence Principle: The effects of acceleration upon a body's inertial mass is equivalent to its gravitational mass in an accelerated frame of reference, but this equivalence can be eliminated by choosing an alternative inertial, non - accelerated, frame of reference where acceleration does not exist. "Whenever an observer detects the local presence of a force that acts on all objects in direct proportion to the inertial mass of each object, that observer is in an accelerated frame of reference" , Albert Einstein, 1911. 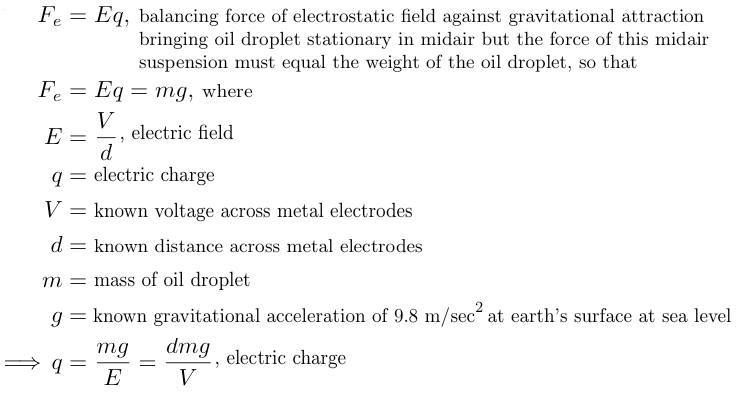 Note: gravitational mass ≡ inertial mass, per general relativity. Event [ world - point ]: Any sufficiently localized occurrence in spacetime to warrant designation in 4 - dimensional coordinates as . Event Horizon: The boundary region in spacetime usually associated with black holes from beyond which nothing is observed emanating from within this bounded region. However recent mathematical research by Prof. Stephen Hawking together with Israeli physicist Jacob Bekenstein of the Hebrew University of Jerusalem, Israel, proposed ( 1972 - 1974 ) that the event horizon of a black hole possesses temperature and hence produces thermal radiation called "Hawking Radiation" which has yet to be empirically observed. Field: Newtonian physics describes the influences of massive bodies upon one another as occurring across great distances instantaneously, where this type of physical behavior is known as "Action at a Distance" whose only intermediary media is the ( luminiferous ) aether and perhaps substantiating a corpuscular theory of light transmission. The magnitude of these mutually attracting forces between any two given massive bodies acting under actions at a distance came to be determined by knowing the masses of the two bodies and was an inverse function of the distance between them. See: Newton's Law of Universal Gravitation. However, subsequent discoveries and advances in mathematical physics disproved the ( luminiferous ) aether assumption by the Michelson - Morley Experiment ( 1887 ) with its concomitant conclusion of the finite speed of light, ; and hence "Action at a Distance" concept came into question. Further mathematical development by James Clerk Maxwell and his equations of electromagnetism demonstrated that interactions between bodies depended not only on distance but also upon their relative velocities propagating light at finite speed, . Thus, finally, "Action at a Distance" concept together with an sort of ( luminiferous ) aether was discarded in favor of intermediary "fields" propagating forces pervading throughout a cosmic celestial sphere of vacuum space. Presently throughout modern relativistic and quantum mathematical physics, gravitational and electromagnetic interactions are wholly explained in terms of field theory concepts. 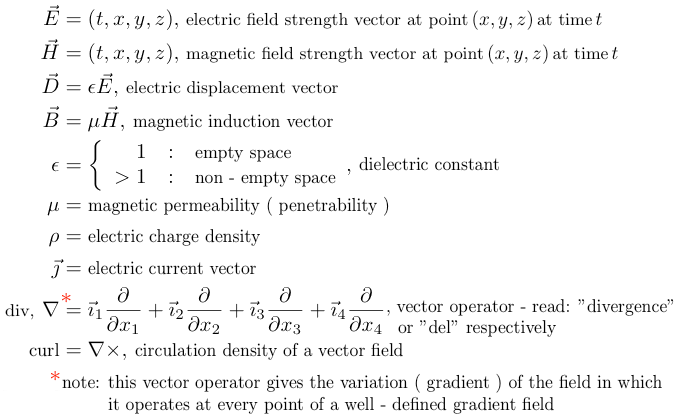 Common examples of fields include the electric field, the magnetic field and the gravitational field. See: Aether; Anthropic Principle; "Action at a Distance"; Celestial Sphere; Corpuscular Theory of Light; Law of Newton's Universal Gravitation; Maxwell's Theory of the Electromagnetic Field; Michelson - Morley Experiment ( 1887 ). ( Summerfeld ) Fine - Structure Constant: See: Anthropic Principle. 1. strong nuclear force - gluons are the carriers of this strong force which only acts directly upon elementary particles such as quarks, leptons and gauge bosons. 2. weak nuclear force - relatively heavy and bosons are the carriers of this weak nuclear force associated with radioactivity decay. 3. electromagnetism - massless ( at rest ) photons are deemed the carriers of electromagnetic force fields. concept of spacetime curvature in order to explain the mutually attractive accelerations existing at great distances between massive bodies. The only fundamental particle which interacts with all four fundamental forces is the quark. See: Inertial Frames of Reference. Frame of Reference [ reference frame ]: Frame of reference is any coordinate system whereby the physical location of a body or object is given in reference to any changes in the course of time. That is, normal spatial coordinate systems make physical reference to location of a body or object without any reference to time, but a frame of reference requires spatial coordinates involving time components of a body or object during all changes in motion. Not only is a time component necessary for defining the physical location of a body or object necessary, but in order that the frame of reference itself be well defined, it is also necessary that both the origin and the coordinate axes orientation of the reference frame be assigned time components at every instant in time for which the reference frame containing the body or object is extant. A frame of reference may be inertial ( non - accelerated ) or non - inertial ( accelerated ). See: Event; Inertial Frame of Reference. Free - falling Frame of Reference: See: Local Frame of Reference. Galilean Relativity: All laws of physics are the same in all inertial frames of reference whether at rest or in motion relative to absolute time and space. See: Absolute Motion, Time and Space by Isaac Newton; General Theory of Relativity; Special Theory of Relativity. Gamma Rays: Gamma ray - photons are the most energetic form of light [ shortest electromagnetic wavelengths, highest energy ] having energies in excess of 100+ KeV and are the source of Gamma - Ray Bursts ( GRBs ), lasting from milli - fractions of a second to several minutes and shining a million trillion times brighter than the Sun at the heart of supernovae in other distant galaxies. The Principle of Consistency: Whenever any new mathematical physics theory is introduced into the realm of physics, the newer scientific theory must incorporate the prior proven successful results and predictions of the legacy theory. 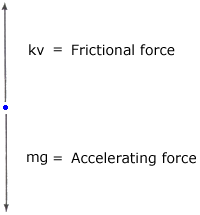 The Principle of Equivalence: The effects of acceleration upon a body's inertial mass is equivalent to its gravitational mass in an accelerated frame of reference, but this equivalence can be eliminated by choosing an alternative inertial ( non - accelerated ) frame of reference where acceleration does not exist. The Principle of General Covariance [ diffeomorphism covariance or general invariance ]: Since coordinate systems do not exist á priori in nature, but are rather artifacts of the mathematical mind, therefore the form of the laws of physics must be invariant in any inertial ( non - accelerating ) or non - inertial ( accelerating ) frame of reference under the condition of having arbitrary differentiable coordinate transformations for which the Tensor Calculus is uniquely suited when dealing with such general relativity, 4 - dimensional transformable tensor fields. 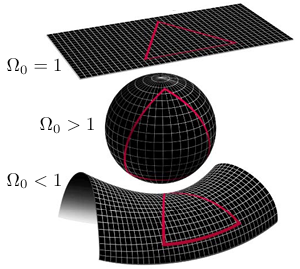 In terms of a non - Euclidean Riemannian geometry whose metric curvature provides the shortest geodetic possible path ( "straightest" path in Euclidean flat geometry ) for mutually gravitating massive bodies in curved ( warped ) spacetime fabric, the presence of matter warps the metric curvature of spacetime for which Einstein interpreted as gravitational accelerating ( pushing ) attractions equivalent to Newton's "Action at a Distance" mutually ( pulling ) attractive gravities. See: Equivalence Principle; Spacetime Curvature. Geodesic: In general relativity the locally shortest paths taken by bodies or objects of matter possessing mass moving in non - Euclidean, curved spacetime geometries such as Riemann's more generalized metric geometries characterized by the parallel ( gyroscopic ) transported Levi - Civita affine connector for smoothly conjoining invariant Spacetime Intervals. Also: a spacetime "Worldline" for which the invariant proper transit time interval will be extremely maximized as shown by the progression of an associated time - clock gyroscope tracing out the "fabric" contours of spacetime geometry. That is, the geodesic is that unique world timeline for which a traversing time - like, gyroscopic clock traveling thru a gravitational field of energy will run the slowest. See: Geodetic Equation, General Theory of Relativity. 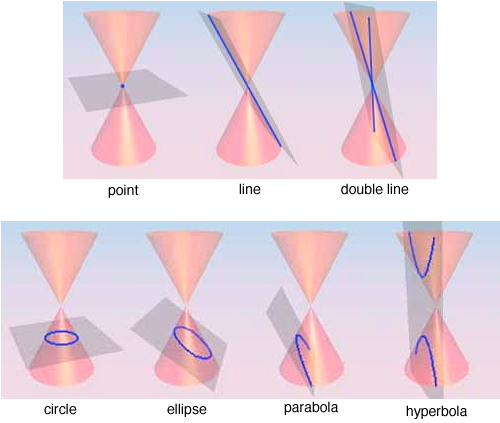 Gravitational Lensing: One of the predictions of general relativity is the bending of light. The phenomenon of gravitational lensing is where light originating from a distant astronomical object such as a galaxy beyond some intervening massive object exerting gravitational effects upon light will result in the bending of incoming light to an observer residing on the opposite side of the intervening massive object. This phenomenon in effect produces a sort of astronomical magnification of distant objects where normally Earth - bound telescopes or even the Hubble and future James Webb telescopes can not go beyond. However, recent Keck Telescope scanning of the universe using gravitational lensing has produced images of six very faint galaxies only 500 million years after the original Big Bang of 13.73 billion years ago! See: Big Bang. Gravitational Mass: Newton: A measure of the amount of mutual attraction massive bodies or objects exert upon each other as they tend to accelerate towards one another following the shortest, Euclidean ( or Cartesian ) distance. See: Equivalence Principle; Inertial Mass. Gravitational Mass: Einstein: A quantitative measure of the gravitational ( accelerating ) force of spacetime curvature pushing together ( Newton's 'attraction' between ) two or more bodies of mass which, according to Einstein's General Relativity Postulate, is equivalent to inertial mass following the shortest, non - Euclidean geodesic of maximum proper time for bodies in transit. See: Equivalence Principle; Inertial Mass; Proper Time. Gravitational Time Dilation: See: Time Dilation. Gravitational Waves [ gravity waves ]: In general relativity theory, oscillating masses will give rise to fluctuations ( or ripples ) in the curvature of spacetime which equivalently produce oscillating gravitational fields traveling as waves at the speed of light, . 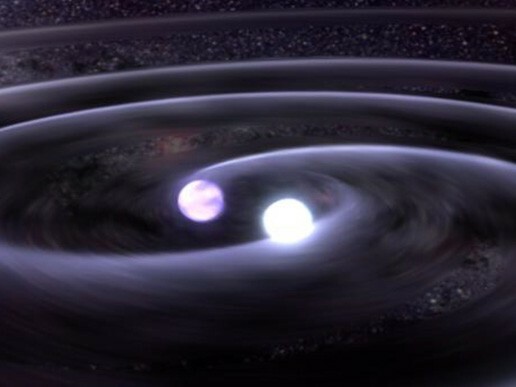 Gravitational waves ( gravity waves ) have only been indirectly shown to exist. The basis for this claim rests upon the 1993 Nobel Physics Prize awarded for measurements of energy loss of the Hulse - Taylor binary pulsar system due to the gravitational waves predicted in general relativity. See: "The Discovery of The Binary Pulsar", Nobel Lecture, December 8, 1993, by Russell A. Hulse; and "Binary Pulsars and Relativistic Gravity", Nobel Lecture, December 8, 1993, Joseph H. Taylor, Jr.
Graviton: In quantum physics, the theoretical but as yet undetected elementary particle that transmits the force of the gravitational field. In string theory, the graviton is a "string state" rather than a point - particle. See: String Theory. i). Baryons - strongly interacting composite fermions ( usually related with matter such as protons and neutrons ) made up of combinations of three quarks. spin consisting of a quark and an anti-quark. See: Copenhagen Interpretation of Quantum Physics; Planck's Constant. Higgs Boson [ The God Particle; since discovered by the Large Hadron Collider ( 2011 - 2013 ) ]: The Large Hadron Collider ( LHC ), located at CERN - European Organization for Nuclear Research - northwest of Geneva on the border between France and Switzerland, began its operation in May 2008 and one of its first tasks will be to empirically verify the existence of the hypothetical, yet elusive, Higgs Boson, the massive elementary scalar particle predicted to explain mass that all other elementary particles possess, especially between the massless ( at rest ) photon, carrier of electromagnetism, and the relatively heavy and bosons seemingly responsible for radioactive decay. i). Isotropy - spacetime is uniform and symmetric in all directions. ii). Homogeneity - spacetime possesses the quality of uniformity in structure and composition in all directions. That is, the geometry ( metric ) of spacetime is the same from any point to any other point in the universe. The observer is the red dot in the rotating, non - inertial ( accelerating ) frame of reference [ lower picture ] observing the constant speed and straight - line movement of the body or particle as it transits its inertial ( non - accelerating ) frame of reference [ upper picture ], whereupon the observer will view the material body or particle as following a curved, accelerated path. 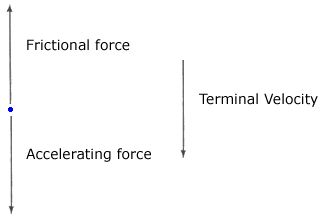 The apparent acceleration of the material body or particle seen by the observer without any other external force present is defined as inertial acceleration. The best example of inertial ( apparent ) acceleration is Coriolis acceleration, also commonly known as Coriolis Effect. Inertial masses are those masses for which Newton's 1st and 2nd Laws of Motion are valid. That is, those frames of reference in which bodies or particles of matter whose masses are not subject to external forces and hence are moving in straight - line directions at uniform rates of speed without any rotational motion are defined as inertial ( non - accelerating ) frames of reference; the masses in such non - accelerating, inertial frames of reference are inertial masses by definition. That is, Newton's inertial mass is the necessary and measurable amount of coercive or enabling force needed to modify the motion and/or shape of a body of matter possessing mass dislodged from its initial inert status, otherwise signifying the condition of that body as being at rest, and all of which begs some rather deep philopsophical questions. 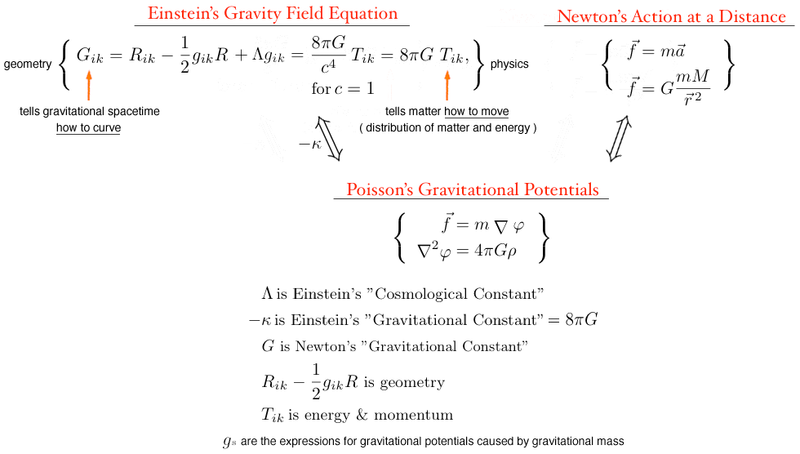 is the Einstein equation for matter in the form of inertial mass which can be derived from a given amount of energy . See: Equivalence Principle; Gravitational Mass. Inertial Frame of Reference [ inertial reference frame, Lorentz frame of reference ]: A frame of reference in which Newton's 1st and 2nd Laws of Motion are valid. 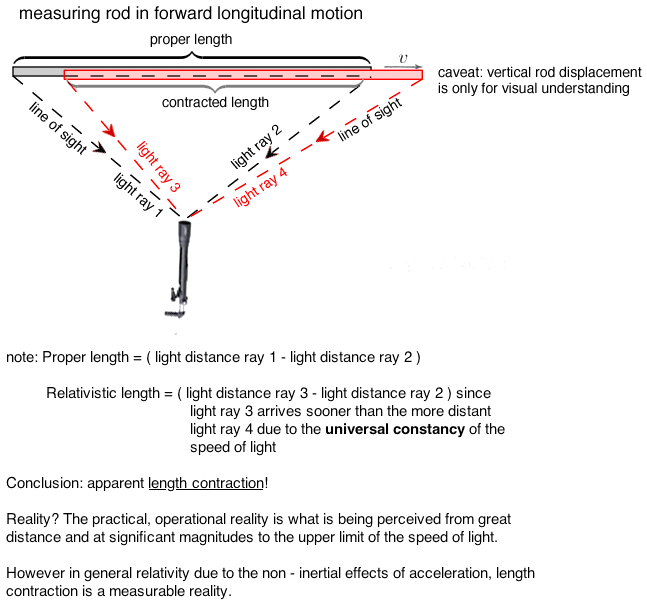 That is, those frames of reference in which bodies or particles are not subject to external forces and hence are moving in straight - line directions at uniform rates of speed without any rotational motion, are defined as inertial frames of reference. Furthermore, given one inertial frame of reference, any other reference frame(s) moving likewise in straight - line direction(s) at uniform rate(s) of speed without any rotational motion relative to the first inertial frame of reference, will also equivalently be considered as an inertial frame(s) of reference. This latter statement expresses the principle of equivalence of inertial reference frames. every material body of matter possessing mass will have a velocity less than or equal to in every inertial system if its velocity in any one inertial system is also less than or equal to . See: Frame of Reference; Lorentz Frame of Reference; Velocity. Interference [ wave interference ]: The interaction of two or more light waves and thereby producing a distinctly different light wave pattern. Interval; Invariant Spacetime: See: Spacetime Interval. Invariant Interval: See: Interval; Spacetime Interval. Invariant Mass [ intrinsic mass, proper mass ]: See: Rest Mass. Inverse Compton Effect: Occurs whenever a photon gains energy from an incoming high velocity, high energy electron and thereby achieves a higher energy level as well as a shorter ( decreased ) wavelength and a higher frequency of radiation. See: Compton Effect. Isotropy: Spacetime is uniform and symmetric in all directions exhibiting constant values - viz. the velocity of light transmission. That is, there is no one preferred reference point or direction in spacetime. While examining the cosmic microwave background ( CMB ) for the large - scale universe, the cosmos appears nearly isotropic although not perfectly. See: Anisotropy; Cosmic Microwave Background ( CMB ). Law of Continuity: Whenever the differences between any two causes are infinitesimally reduced, the difference as between their respective effects are concomitantly reduced since the principle of the identity of indiscernibles is invoked. See: Continuum. where is the universal gravitational constant, finally and fairly accurately implicitly determined [ within 1% ] in 1797 by British Henry Cavendish ( 1731 - 1810 ) whose original intent was to calculate Earth's density relative to water. Lepton: The electron, muon, tau and their associated neutrinos are all members of the elementary lepton particle family. 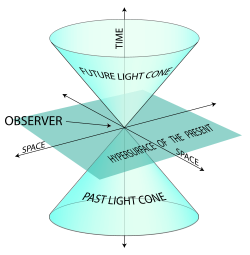 Light Cone: For an observer of an event at time , all those sets of directions of light traveling away from the event ( future light cone ) together with all those sets of directions of light traveling towards the event ( past light cone ) constitutes the light cone associated with the given event. All other events are in Elsewhere and will never affect, or be known to, the observer at time . Local Frame of Reference [ local reference frame ]: Normally the coordinate systems of a frame of reference extends indefinitely into unlimited spacetime of the celestial sphere. A local frame of reference is one where the coordinate system is defined only in the immediate or restricted vicinity of some spacetime region containing a specified point or trajectory of a massive body or particle. If a local frame of reference is defined within a larger frame of reference such that an object within its definition appears unaccelerated while the overall local frame of reference relative to the larger reference frame is engaged in accelerated motion, the object will have the experience of being in a free - falling frame of reference - i.e., "a falling man feels no gravity". Furthermore, this restricted local frame of reference ( special case of the larger frame of reference ) is also known as a "Galilean region". The free - falling frame of reference cannot, however, itself be extended indefinitely over spacetime since the non - Euclidean metric curvature of unlimited and infinite spacetime becomes obvious as larger gravitational fields exert themselves. Lorentz Frame of Reference [ Lorentz Coordinate System in Minkowski geometry ]: The spacial coordinates in a Lorentz frame of reference for units of time in Minkowski four - dimensional spacetime geometry are chosen so that the speed of light in empty space ( in vacuo ) is invariant in all directions, at all locations and at all times. See: Galilean Relativity; Length Contraction; Poincaré Transformations; Time Dilation. Mass: See: Equivalence Principle; Inertial Mass; Gravitational Mass. completely expresses that matter and energy are interchangeable and hence equivalent in an inertial, non - accelerating, frame of reference. See: Energy; Inertial Frame of Reference; Inertial Mass; Special Relativity. What makes for the unity of all of electrodynamics is Maxwell's Equations plus Lorentz Force Law. equation (4): Every electric current produces its own magnetic field. "The agreement of the results seems to show that light and magnetism are affections of the same substance, and that light is an electromagnetic disturbance propagated through the field according to electromagnetic laws". Maxwell's Theory of the Electromagnetic Field: According to Maxwell's equations, electromagnetic radiation ( EM ) is a self - propagating transverse wave with electric and magnetic components where the oscillating electric and magnetic field components induce their respective opposites and vice versa. These electric and magnetic components oscillate at right angles to each other where the entire electromagnetic "envelop" or field propagates perpendicularly to these oscillating electromagnetic wave - components in the direction in which they indefinitely travel unless absorbed by intervening matter. That is, each kind of field - electric and magnetic - generates the other in order to propagate the entire composite structure moving forward through empty space at the finite speed of light, . In order of increasing frequency, the types of electromagnetic waves include radio and television waves; microwaves; infrared radiation; visible light; ultraviolet light; - rays; gamma rays; and finally, cosmic rays. See: "Action at a Distance". 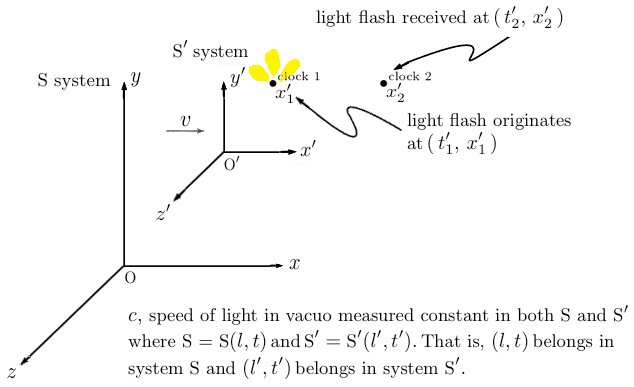 Michelson - Morley Experiment ( 1887 ): If the Luminiferous Aether Theory is correct, then as Earth passes ( ≈ 18 mi/sec or 30 km/sec ) in its solar orbit thru the hypothesized stationary aether and by the addition of velocities of the Earth plus any velocity of light ( already known to be about 186,300 mi/sec ) emanating from the Michelson - Morley interferometer instrument on the Earth, either "constructive" or "destructive" interference fringes will be detected. In other words, if the hypothesized luminiferous aether exists, then there will be "destructive" interference fringes as the Earth transits thru it and the luminiferous aether thereby inhibits the flow of interferometer source light; in other aligned directions of Earth's passage thru the aether and the interferometer instrument itself ( the Michelson - Morley interferometer can be rotated 360° in its mercury bath ), there should appear "constructive" interference fringes. Hence, pointing one arm of the Michelson - Morley Interferometer in the direction of Earth's transit orbit should produce an interference fringe pattern amounting to 0.4 fringe width where the instrument was sensitive to 0.01 fringe width. And in this way, it should be able to detect either the Earth's velocity thru the stationary aether or from the perspective of the laboratory, the velocity of the aether wind itself should be detected across a stationary Michelson - Morley Interferometer. Eventually the Michelson - Morley Experiment provided the first strong empirical evidence against the Theory of a Luminiferous Aether while determining = 299,796 km/sec ( 186,265 miles per second ) is finite which in turn became the basis for the Fitzgerald - Lorentz transformation equations. Jewish - American Albert Michelson was the first American awarded the Nobel Prize for Physics in 1907. See: Aether; Fitzgerald - Lorentz Transformation Equations. Minkowski Space [ Minkowski spacetime, Minkowski spacetime geometry, flat spacetime ]: A four - dimensional, non - Euclidean geometry which best and most elegantly represents special relativity theory was published in 1908 by Jewish - German mathematician Hermann Minkowski ( Russian born 1864 - 1909 ), three years after Einstein's special relativity mathematics came into being. Minkowski space is often referred to as flat spacetime in the presence ( or limit ) of weak gravitational force. "The views of space and time which I wish to lay before you have sprung from the soil of experimental physics, and therein lies their strength. They are radical. Henceforth space by itself, and time by itself, are doomed to fade away into mere shadows, and only a kind of union of the two will preserve an independent reality", by Hermann Minkowski, 1908. Neutrino: Elementary particle traveling close to the speed of light, , without electric charge and almost massless whose exact mass is still too small to be presently measured at this time. Neutrinos are therefore extremely difficult to detect where, for example, emanating from the Sun's solar wind more than 50 trillion solar electron neutrinos pass through the human body every second ! Neutron Star: An extremely dense collapsed remnant of certain massive stars consisting almost entirely of neutrons having densities in general of less than 1.44 solar masses. Newton Relativity: See: Galilean Relativity. ( Emmy Amalie ) Noether's Theorem: All physical laws of conservation are based upon the proposition that they are invariant with respect to time. Parallax [ stellar parallax ]: Against a very distant seemingly "fixed star" background, any relatively nearby star will display an apparent movement as Earth makes its yearly orbital transit about the Sun. This apparent movement produces an angle of perception called "angle of parallax" which is used to measure the distance to the star from Earth. This phenomenon is similar as to when an object is held at arm's length and seems to move against a more distant background as each eye is opened and closed. However at extreme distances the angle of parallax becomes infinitesimally small and hence unusable. See: Parsec; also Aberration ( of starlight ) which is a totally different phenomenon. Parallel Transport: Gyroscopic motion. Gyroscopes moving in an affinely ( smoothly ) connected field of gravity. See: Geodesic; Geodesic Equation. 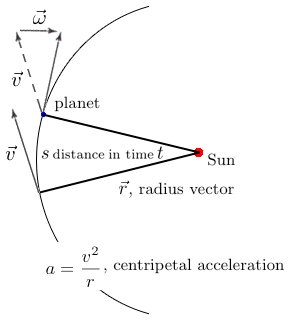 Parsec: Angle of parallax in seconds of arc which is used to measure distances to stars from Earth. See: Parallax. Photoelectric Effect: A quantum physics phenomenon whereby electrons are ejected from ( metal ) matter after bombardment by electromagnetic photons in the range of either visible light or - rays whose mathematical explanation by Albert Einstein extended the quanta work of Max Planck. Einstein won the 1921 Nobel Prize in Physics precisely "... for his services to Theoretical Physics, and especially for his discovery of the law of the photoelectric effect". Ironically, however, Einstein never won any Nobel Physics Prize for special relativity theory as this was deemed theoretical mathematics, actually belonging to the realm of philosophy, and hence not eligible for any Nobel prize. Planck's Constant: Nature's fundamental constant, designated as . Without Planck's Constant there would no understanding of sub - atomic processes as it is used to set the basic sizes of quantization for all other sub - atomic phenomena such as the electron and photon and the like. Revealingly as to the vital role of Planck's Constant in understanding nature's forces, classical physics can be defined as when Planck's Constant tends to zero! Planck's Reduced Constant: See: Dirac's Constant. Poincaré Transformations: This is a generalized vector representation of Lorentz Transformation rules in four - dimensional Minkowski spacetime involving 10 parameters of a Lie Group ( Norwegian mathematician Sophus Lie, 1842 – 1899 ) for the continuous symmetry of differential spacetime manifolds which makes these groups the best mathematical objects for understanding theoretical particle physics. See: Lorentz Transformation Equations; Minkowski Space. Principle of Complementarity: See: Copenhagen Interpretation of Quantum Physics; Heisenberg Uncertainty Principle. See: Equivalence Principle; Gravitational Mass: Einstein; Inertial Mass. Principle of Galilean Relativity: See: Galilean Relativity; Galilean Relativity [ Galilean invariance, Newton Relativity ] vs. Special and General Relativity. Proper Time: The time - invariant companion associated with the spacetime ( distance invariant ) interval. More simply, proper time is the time measured by a stationary clock at rest between two events occurring coincident with the clock itself. It is analogous to arc length in Euclidean three - dimensional space. See: Spacetime Interval. Quark: A fundamental particle that is one of the two of basic constituents of matter, the other being the lepton. The quark is the building block for protons, neutrons as well as all other hadrons and mesons. This particle is the only fundamental particle which interacts with all four fundamental forces of nature. The anti - particle of the quark is the anti - quark. See: Four Fundamental Forces of Nature; Hadron. Quintessence: A theoretical form of dark energy which possesses an equation of state for scalar energy density fields that varies through time and space, in contrast to a static cosmological constant for fixed scalar energy densities in the universe. See: Dark Energy; Equation of State. Relativistically Invariant: That which remains constant under some transformation in all frames of reference - viz., the speed of light, , under a Fitzgerald - Lorentz Transformation; time under a Galilean Transformation; and the Spacetime Interval defined for special relativity. See: Fitzgerald - Lorentz Transformation; Spacetime Interval; Special Theory of Relativity. Relativity Principle: All the laws of physics in their simplest reduced form are transformable and hence invariant as between an infinite number of moving reference systems ( inertial systems ), each one of which is moving uniformly and rectilinearly with respect to any other system and where no one system is privileged or preferred over any other reference ( inertial ) system when measurements of length or time are taken. See: Absolute motion, time and space by Isaac Newton. See: Special Theory of Relativity. Rest Mass [ invariant mass, intrinsic mass, proper mass ]: The amount of mass that a body or particle possesses as observed in a frame of reference to which it is at rest. is invariant for all observers in all frames of reference. See: Special Theory of Relativity. Spacetime [ space - time ]: Einstein's mathematical model of 4 - dimensions combining space with time into a geometric construct called spacetime ( spacetime continuum ) whose warping ( metric distortion ) in the presence of mass is interpreted as gravitational attraction. Whereas there are different intervals of distance or time for different frames of reference for observers in relative motion, the spacetime interval is an invariant between any two spacetime events for all observers across all frames of reference. See: Spacetime Interval; General Theory of Relativity. Spacetime Curvature [ space - time curvature ]: The non - Euclidean geometry whose metric curvature provides the shortest ( "straightest" ) possible path for mutually attracting massive bodies in curved ( warped ) spacetime fabric. That is, the gravitational inertial effect of acceleration derived from massive bodies of matter upon relativistic beams of light, is what produces the geometry of spacetime curvature. See: General Theory of Relativity. Spacetime Interval [ space - time interval ]: A four - dimensional "distance - invariant" between any two spacetime events for all observers across all frames of reference provided that a Lorentz coordinate system is used - i.e., that Lorentz transformation laws are valid for whatever coordinate system is employed. This "distance - invariant" is unlike other intervals of time or distance for observers in relative motion which can vary according to relative velocities assigned to the respective reference frames; thus the 'spacetime interval' is the distance concept used in the geodesics of general relativity. 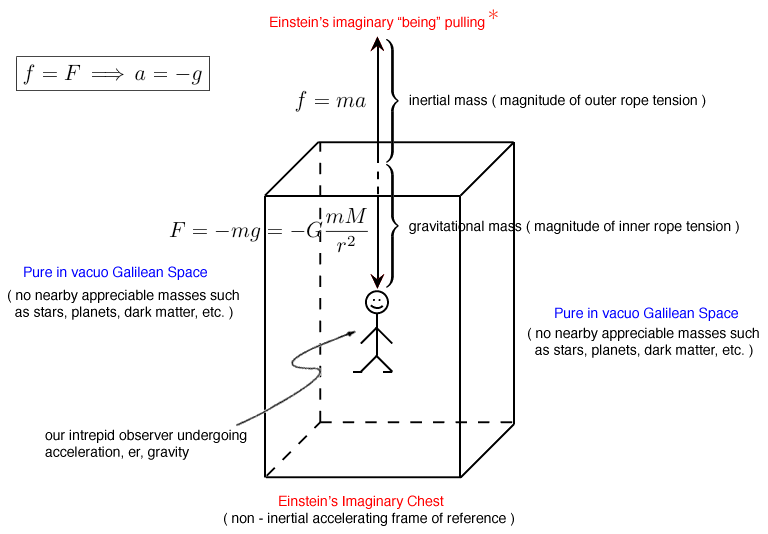 See: Lorentz Transformation Equations; Spacetime; General Theory of Relativity. The values of a spacetime interval may be zero, real or even imaginary, but for those spacetime intervals which are real and positive, invariant proper time is counted at a clock from an arbitrarily chosen point between the two events by a co - moving observer traveling between them where relativistic time ( different from proper time! ) increases in the future direction of motion and, thus, time dilation is not only a function of the two events but also depends on the relative motion of a clock traveling between the two events. Zero spacetime intervals are separated by the propagation of light. The trajectory of a particle or massive body forms a spacetime curve whose four - dimensional event - points are time - wise separated by invariant proper time intervals, and any clock carried alongside the particle or massive body will generally indicate proper time if not otherwise effected by gravitational masses, accelerations, or other external forces. Scalars: Quantities having only magnitude such as distance, speed, energy, time, and mass. See: Vectors. Special Theory of Relativity [ SR, Special Relativity ]: Special Relativity was first published in 1905 by Albert Einstein at age 26 working quietly in the Swiss Patent Office, Bern, Switzerland, under the title "On The Electrodynamics Of Moving Bodies", translated from "Zur Elektrodynamik bewegter Körper", Annalen der Physik, 17, 1905.
note: special relativity considers only inertial ( non - accelerated ) frames of reference whereas general relativity considers all frames including accelerated ( non - inertial ) reference frames. Speed of Light [ The Speed of Light ]: As light travels at a constant 186,000 mph ( 300,000 km/sec ), but only in vacuo, light indeed slows down and hence bends while passing thru fields of gravity as well as thru other media such as air, glass, and water. In fact, it is vitally important for human perception of the external world that light slows down upon entering Earth's prismatic atmosphere and thence into the glass lenses of telescopes as well as the intraocular lenses of human eyes as this allows for a time delay for human eyes and brains to process images. Otherwise, human eyes would perceive only distortions of the external world such as what Star Aberration produces. See: Star ( Starlight ) Aberration. String Theory [ Superstring Theory, M - Theory ... 'M' for mysterious, marvelous or magical ]: This theory replaces the standard model description of quantum "point particles" with infinitesimally small ( at the scale perhaps of Planck's Constant at about 10-35 m ) vibrating open or closed ( loop ) strands of energy whose differing oscillating resonant frequencies and different vibrational modes ( how particular strands or spaghetti bunches of strings vibrate analogous as to how particular guitar strings will produce many different notes ) determine exactly which type of quantum particle will emerge from a multitude of possibilities. Also the splitting and recombination of strings appear to produce analogous situations in quantum theory for known interactions of particles emitting and absorbing other particles. M - Theory posits the possibility that the most comprehensive explanation for physical reality involves the existence of higher degrees of freedom equivalent to 10 - , 11 - , or even 26 - dimensional ( depending on the particular string theory being advanced ) spacetime membranes or branes for universes parallel to our own; this latter is called brane cosmology. The ultimate goal of string theory is to produce a higher mathematics of physics uniting all four forces of nature by combining general relativity and quantum field theory physics into a comprehensive DNA - like "Theory of Everything" where one such result would therefore be "quantum gravity". Presently all string theories have not yet produced falsifiable hypotheses which could be submitted to verifiable empirical testing, however with the Large Hadron Collider ( LHC ) in CERN coming on line in May 2008 it may yet be possible to devise a series of testable string hypotheses within our lifetimes. Superluminal Velocity ( FTL, faster than speed of light ): The apparent velocity of an object at speeds greater than the speed of light. This illusory appearance of velocity greater than is caused by a "projection effect" by the object's acute angle of motion towards ( almost perpendicular to ) the line - of - sight of an observer on Earth. See: Speed of Light. Tachyon: Originally inspired by early string theorists, these hypothetical particles were characterized as having superluminal velocity ( FTL or faster than speed of light, ) but according to modern quantum physics field theory these particles are non - existent due to the theoretical instabilities that they would bring into all other quantum systems. Greek etymology: tachys; "tachy" meaning fast, accelerated, rapid. Tensors: A mathematical object usually represented as a matrix having components equal in number to the dimensionality of the geometry of the spacetime in which it is being defined. The mathematical tensor object can be invariantly transformed between different multi - dimensional coordinate systems and therefore is independent of any specific frame of reference. The mechanics of tensor manipulation are an extension, or actually a generalization, of linear matrix algebra into a multi - linear matrix algebra. In special relativity, a uniformly moving clock relative to a stationary clock in an inertial frame of reference present at two events will show time measured that is slower than that of the stationary clock for the same two events. The amount of time ( slowness ) dilation is given by the Lorentz factor operating on the time observed for the moving clock by the stationary observer relative to his stationary clock. Since all motion is relative in special relativity, time dilation is reciprocal; that is, an observer at either of the two clocks will be stationary relative to the other clock and therefore it will reciprocally be the other clock which will be time dilated to the ( relatively stationary ) observer. 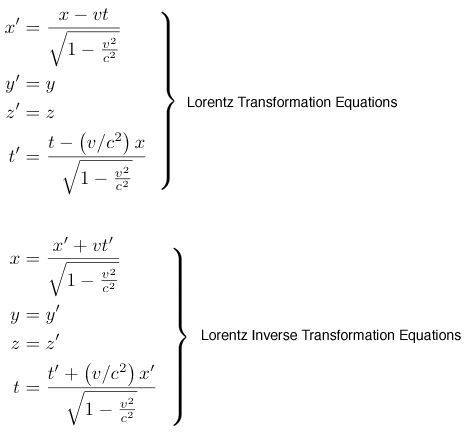 See: Lorentz Transformation Equations; Lorentz factor. In general relativity, on the other hand, where the Principle of Equivalence as between gravitational attraction and acceleration is invoked, the phenomenon of gravitational time dilation of clocks running slower in greater potentials of a gravitational field ( where by definition there is greater spacetime metric curvature ) will be agreed upon by any other stationary observer of these same clocks throughout the gravity field, notwithstanding differences in altitude. In other words, clocks at ground level to a planet's gravity field will run slower than those same clocks at higher altitude and that all observers, at whatever altitude, will agree with these same time dilation results. Hence, in general relativity gravitational time dilation is not reciprocal. Trajectory: The curved path along which a massive body or other particle travels through spacetime. In special relativity, the trajectory is described by Minkowski's four - dimensional spacetime coordinates. In general relativity a specialized trajectory through a gravitational field is the Geodesic World Line for which the invariant proper time interval is a maximum - i.e., the extremal maximum proper transit time for the most efficient use of transit motion energy. Trajectories can be particle paths in large - scale accelerators or planetary orbits. 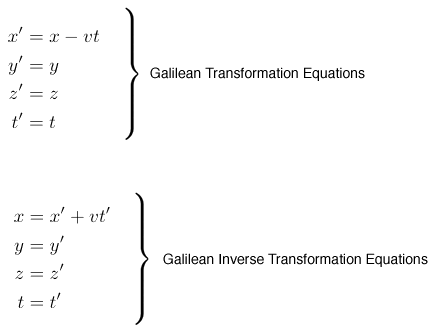 Transformation Laws: A mathematical rule by which if the components of a vector or similar quantity is known in one coordinate system, therefore its components with respect to any other coordinate system may likewise be conserved. Twins Paradox [ Clocks Paradox ]: Special relativity applies only to inertial ( non - accelerating ) frames of reference. But since the traveling twin "jumps" frames by accelerating away from Earth and hence achieving relativistic velocity and then decelerates on his return flight in order to achieve safe landing back on Earth in order to reunite his clock with that of his Earth - bound twin brother, both of whose clocks were originally synchronized, time dilation or slowness of clock has already occurred for the traveling twin when comparing his clock to his Earth - bound twin brother upon his return. This has subsequently been proven correct during a 1971 time dilation experiment using four atomic clocks flying around the Earth on a British Airways plane and these differed with the stationary atomic clock upon return by 40 billionths of a second, in complete confirmation of Einstein's general relativity equations. Also, gravitational acceleration upon both physical and biological clocks dictate time dilation effects where Einstein's general relativity mathematics best explains the physical time dilation aspect of this phenomenon. See: PBS's NOVA Science - "Time Dilation Experiment, October 1971" at http://www.relativitycalculator.com/stationary_moving_clocks.shtml. Ultraviolet Catastrophe: The absurd proposition in early 20th century physics that an ideal black body at equilibrium will continue to emit an infinite amount of electromagnetic energy. Max Planck inadvertently solved this absurdity in 1900 based upon his concept of "quanta" energy packets ( 'photons' in the quantum lexicon interpretation of electromagnetism ) as was eventually shown by Einstein in his 1905 Special Relativity. Although Max Planck did not initially intend to solve the ultraviolet catastrophe problem with his Planck Constant, part of Planck's Black - body Radiation Law, he nevertheless received the 1918 Nobel Physics Prize as a result of his work using Einstein's 1905 Special Relativity interpretation. See: Planck's Constant; Special Theory of Relativity. Definition: A mathematical object expressing both magnitude and direction in contrast to scalars which have only magnitude. In 3 - dimensional space, a vector is a 3 - component tensor of contravariant rank 1. See: Tensors. Addition ( vector summation ): Placing vectors head to tail. Mathematically if vectors are described in terms of their components, the components of the composite vector sum are given as the sums of the respective components of the individual vectors. Equality: Two or more vectors are equal if they possess the same magnitude and direction. The time - rate change of distance displacement in both magnitude and/or direction of a body or particle with respect to some ( inertial or non - inertial ) frame of reference is defined as velocity. But insofar as light as electromagnetic waves is spherically propagated as a celestial sphere throughout spacetime simultaneously in all directions and hence in no specified direction, the speed of light, denoted by from the Latin celeritas meaning speed or swiftness, is a scalar quantity with magnitude only as opposed to being a vector quantity. At velocities approaching the speed of light, , mass - particles and other object bodies of matter possessing mass contract in the longitudinal direction of motion as well as the measurement of time dilation ( time intervals expand ) as seen by an outside ( relatively ) stationary observer. In fact, the speed of light itself determines the very upper limit of velocity at which any object body of matter possessing mass or mass - particle can attain because otherwise the frame of reference of such an object body ( or mass - particle ) would "outrun" any light propagation emanating from itself. This then would violate the Lorentz Transformation Equations upon which all else has been derived up to this point in our discussion of Special Relativity by giving imaginary number results as can be viewed directly from the Lorentz equations themselves. and hence any distortions in either a body's longitudinal distance in physical length or its time dilation of travel due to the relativistic effects of motion will have be accounted for, so to speak, by a "Lorentz Correction Factor". every object material body of matter possessing mass will have a velocity less than or equal to in every inertial system if its velocity in any one inertial system is also less than or equal to . See: Inertial Frame of Reference; Lorentz Factor. Wave Packet: An envelop or packet of particle - waves consisting of an arbitrary number of different waves where the composite "probability wave" is assigned a Heisenberg uncertainty probability for measuring either position or momentum for particular particle states. See: Heisenberg Uncertainty Principle. White Dwarf [ degenerate dwarf ]: Our known universe is approximately 13.73 ≈ 14 billion Earth - years whereas our Earth has been in existence for some 4.5 billion years. Earth's Sun has already been around for some 4.57 billion Earth - years. It will however in another 1 billion Earth - years begin to enter its red giant phase and begin to burn off Earth's atmosphere and oceans while pushing Earth into a farther and more distant orbit owing to a lessening of the Sun's mass and hence its gravity pull. 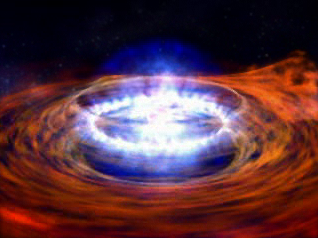 Eventually the Sun in another 4 - 5 billion Earth - years will be fully entered into its red giant phase and will thereafter first evolve into a hot white dwarf and then descend into a cooling white dwarf as it consumes its remaining internal material without nuclear fusions, its light fading away as a life source for Earth. Because nuclear fusion no longer burns within a cooling white dwarf, it undergoes gravitational collapse and falls within itself producing a collapsed star having the density of the original Sun but with a volume of the original Earth. And as it gradually consumes whatever remaining internal material it originally possessed when hot, the white dwarf gradually radiates away any remaining internal heat energy. The Sun will therefore eventually cool down to the point of theoretically becoming a cold black dwarf, although due to the present age of the universe none are yet thought to exist since the oldest of these white dwarfs still radiate heat temperature to the extent of a few thousand kelvin black bodies. Earth will literally die of intense heat and later die of intense cold. Planet Earth as a spaceship for human existence is therefore existentially doomed. becoming shorter. Because of this, the two stars are destined to merge. in our galaxy, directly detectable by future space-based gravity wave instruments. 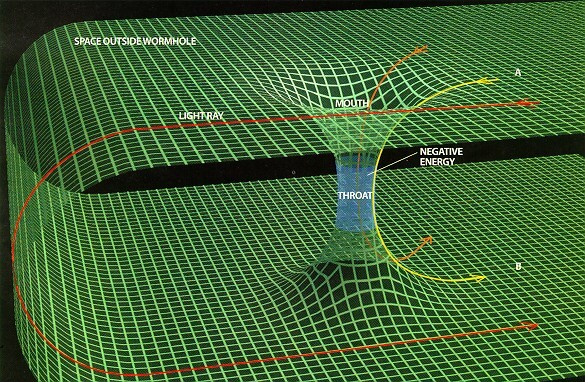 Worm Hole: A theoretical "tunnel" linking distant locations of spacetime through which time and space travel between hypothetical parallel universes would be possible. The theoretical tunnel or throat would resemble an umbilical - like connection with at least two mouths on either side of the parallel universes. Prof. Amos Ori, Technion University, Haifa, Israel, has been proposing such a hypothetical mathematical topology with valid solutions within the framework of general relativity since at least 2005 with his sundry submissions to Physical Review journal.